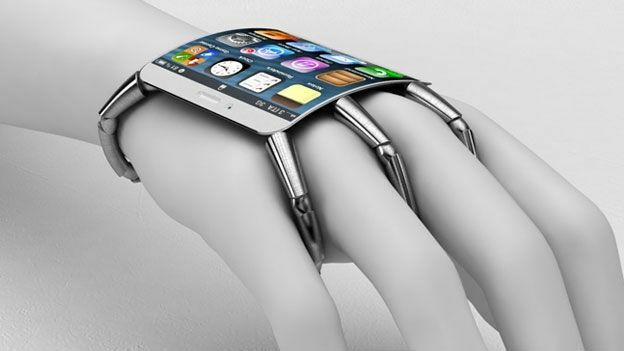 A new Apple iPhone 5 concept has hit the web showcasing a futuristic wearable device that, despite its attention griping design, is unlikely ever to become a reality. Dubbed the iPhone Spider, the sci-fi-styled device takes the term 'handset' to new levels with the curved back smartphone playing host to five malleable legs that attach to a user's wrist and slot between their fingers for what appears to be a somewhat obtrusive fit. The mechanical glove-like device looks remarkably like the face grabber from the movie Aliens, although some may argue that it looks more like an iPod Nano with metalic legs attached. Eitherway, we think it's pretty neat. The work of designer Federico Ciccarese, the iPhone 5 Spider concept is a world away from past mocked-up Apple iPhone 5 designs which have seen the current glass back scrapped for a brushed metal option and a new 19 pin port replace the longstanding 30 pin connector. The thing of rumour and speculation for a number of months, Apple iPhone 5 rumours have kicked into overdrive in recent weeks after June's WWDC event saw Apple officially unveil its iOS 6 mobile operating system, a piece of software that is expected to launch on the next-gen iPhone later this year. With a late September, early October iPhone 5 release tipped, Apple fans can expect the next-generation handset to land with a Samsung Galaxy S3 quad-core processor as well the usual camera optic improvements. Elsewhere, one of the most frequent flowing iPhone 5 rumours has suggested the handset will sport a larger, 4-inch display and a completely overhauled design that will see the sixth-gen smartphone line up as Apple's slimmest device to date. What would you like to see from Apple's next-generation iPhone device? Is a wearable hand restraint the way forward? Let us know what you think via the T3 Twitter and Facebook feeds.